JTA were approached, by a local developer to explore the possibility of developing a property in the Brockley Conservation Area, Lewisham. Combining our experience of working with existing buildings and knowledge of local planning policy JTA were able to produce a range of options that satisfied the clients brief. The proposals created two new apartments over ground and lower ground floors, a studio apartment in the loft and the renewal and extension the existing properties at first and second, bringing them up to modern standards. Design approach Key to the reorganisation of the building was the demolition of the existing smaller extension, enabling the designs to maximise the available floor space within the existing building. This approach allowed JTA to combine the best of the existing building with modern interventions to create desirable new apartments. Material choices Well detailed modern glazing played off against more traditional brick forms were key to the positive feedback the designs received in Pre-Application Advice, with local authority offices supportive of an approach which was both modern and contextually driven. 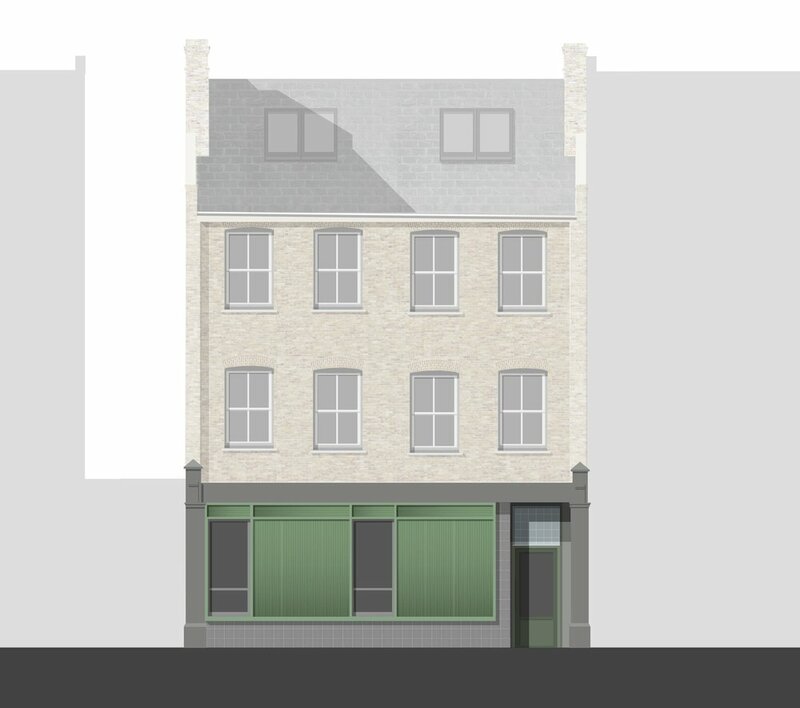 Contextual analysis JTA were keen to retain as much of the character in the front elevation as possible, the existing shop front served as inspiration to create a playful yet contextually appropriate response, that would be a welcome improvement to the Conservation Area.